MOSCOW, the Russian Federation, (BulgarianMilitary.com) – On 4 November, the Russian Defence Ministry announced that the Space Troops’ operational crew, part of the Russia’s Aerospace Force, successfully launched a new Glonass-M navigation satellite with the Soyuz-2.1b medium capacity carrier rocket to become part of Russia’s Global Navigation Satellite System (GLONASS) constellation . The last GLONASS expansion happened on Saturday (3 November) at 11:17pm Moscow time, from the spaceport at the Plesetsk Cosmodrom, located in Mirny, Arkhangelsk Oblast, learned BulgarianMilitary.com. The launch of the Soyuz 2.1b rocket, which on Saturday, has delivered to orbit the Russian Satellite Navigation System also known as Uragan-M, was carried out under the general command of the Space Troops’ Commander and Deputy Commander-in-Chief of the Aerospace Force, Colonel General Alexander Golovko, from launching unit 4 at platform 43 of Plesetsk Cosmodrome. The control over the launch and the flight of the carrier rocket was performed by the Russian Aerospace Force operational group, using its systems of the land automated complex for spacecraft operation. According to the statement of the Russian Defence Ministry all the pre-launch operations that began in early October with the arrival of the spacecraft at Plesetsk, as well as the launch itself, were carried out in a routine mode. Data, reported earlier says that the launch vehicle was fully assembled in late October and rolled out to the launch platform on October 31. In order to bring the Glonass-M spacecraft into orbit, the operational crew launched the Soyuz 2.1b rocket, which flew in a configuration that uses a Fregat-M third stage. After the upper stage was completed the core stage took control over the mission and powered the launch vehicle until it was detached at about four-and-a-half minutes after its start. Then the third stage ignited and assumed control over the flight for about seven minutes. As the Russian Ministry of Defence reported the Fregat upper stage with the Glonass-M satellite separated properly from the Soyuz-2.1b third stage at 11:28 pm Moscow time. For this year, this is the fourth launch of a Soyuz-2 carrier rocket and the second of Glonass-M from Plesetsk Cosmodrome. The previous navigation satellite was delivered into orbit on 17 June 2018. 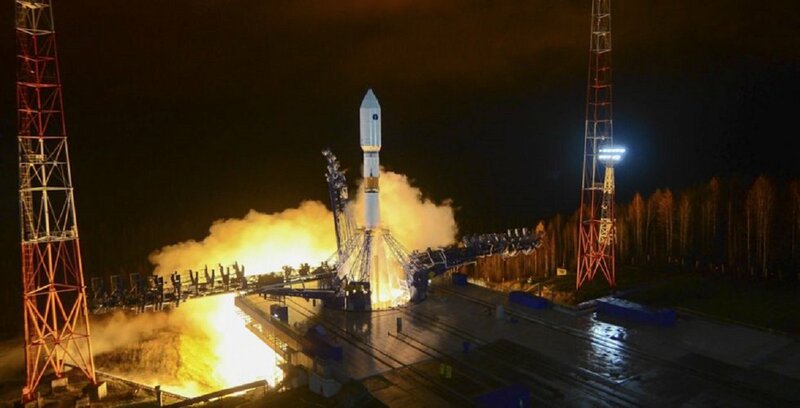 The navigation satellite launched on Saturday has completed the Russian GLONASS orbital grouping, which currently consists of 27 spacecraft of which one is a new generation satellite, one is undergoing flight trials and one Glonass-M spacecraft is under maintenance.